Germans developing advanced technologies during the end of the war is a matter of public record. I have seen enough of their designs and production plans to realize that if they (the Germans) had managed to prolong the war some months longer, we would have been confronted with a set of entirely new and deadly developments in air warfare. The dominant explanation for the origin of UFOs is the Extraterrestrial Hypothesis (ETH). Other hypotheses have been proposed as supplementary to ETH, among them the so-called "Nazi Hypothesis". Witness testimony, photographs, and purported plans exist to suggest that some Unidentified Flying Objects (UFOs) may have originated in pre-1946 Germany. This evidence has been downplayed for a number of reasons. An obvious factor is that documents and witness testimony tend to be in a foreign language. The universal revulsion felt for the Nazi regime and its occult origins is another factor. Then, too, some of the data seem to have been filtered through neo-Nazi sources. Most difficult for some, perhaps, is that the implicitly underlying physics for these craft must have been concealed from most of us for 60 years or more. However, the ETH involves a similar element of concealment, if only for a shorter duration. There is no question that the Germans produced a number of scientific breakthroughs in their quest for war technology during World War II. The V-1 buzz bombs - a forerunner of today's cruise missiles - and the V-2 rockets that terrorized London are two of the most famous examples, along with the Messerschmitt 262, the world's first operational jet fighter. There is no question that the Germans were experimenting with a wide variety of innovative aircraft and propulsion systems toward the end of the war. There is little doubt that they at least contemplated building a flying saucer. There are tantalizing bits of evidence that Nazi Germany indeed added a flying disc to its inventory of secret weapons. In retrospect, Americans should have correlated the WW II and post-war sightings of flying spheres, saucers, and cylinders to the wondrous technology of National Socialist Germany. It is an understatement to say that our government has deliberately misled us on the UFO question. 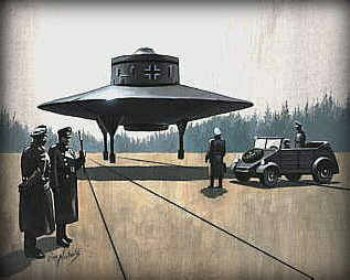 Rumors have persisted for decades that German forces continued to wage a secret war after May 1945, using exotic technology - especially UFO based psychological warfare. 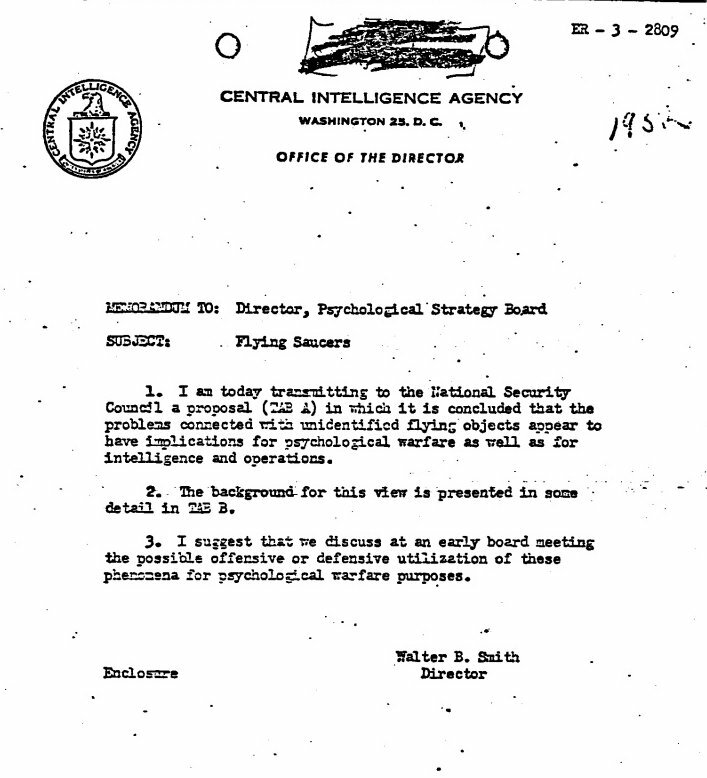 I am today transmitting to the National Security Council a proposal (TAB A) in which it is concluded that the problems connected with unidentified flying objects appear to have implications for psychological warfare as well as for intelligence and operations. I suggest that we discuss at an early board meeting the possible offensive or defensive utilization of these phenomena for psychological warfare purposes. We know from eyewitness accounts and recovered records that the German military machine was making great strides in experimental research. So successful in pioneering rocketry were they, that immediately after the war tons of material plus hundreds of scientists were siphoned off by the allies -- both east and west. The Nazi war machine swung into action utilizing as much as it could of the most up-to-date scientific knowledge available, and as the war developed the list of further achievements grew to staggering proportions. From guns firing shells of air to detailed discussions of flying saucers, from beams of sound that were fatal to a man at 50 yards to guns that fired around corners and others that could 'see in the dark' - the list is awe-inspiring in its variety. Since the 1950s there were many claims about alleged German developments of revolutionary saucer-shaped crafts able to fly with incredible performances, from a sort of "supersonic helicopter" to hard-to-believe interstellar spaceships. These crafts were believed the same "flying saucers" (later named UFOs) sighted by many people all around the world since 1947. According to the many would-be "inventors" and enthusiasts of this theory, UFOs would not be of extraterrestrial origin but man-made. According to the many would-be "inventors" and enthusiasts of this theory, UFOs would not be of extraterrestrial origin but man-made. The "German saucers" are often known also as the "V-7 legend": this comes from a reportedly circular aircraft named "V-7" that is claimed to have flown in Prague on February 14, 1945. The conventional view of history is that, while the Germans possessed some remarkable and deadly weapons such as the V-l, the V-2 and the jet-engined Messerschmitt ME-262 fighter, their technological innovations did not extend much further than that. Indeed, serious historians treat claims of fantastic advances in Nazi technology with the utmost disdain. The problem is that the majority of people that dispute German disc developments have never heard of these largely classified devices. Ignorance does not make them myths. Granted, Rudolf Lusar, Renato Vesco, Justo Miranda, and Ernst Zündel have made some grievous errors in telling the story of German disc aircraft development during WW2; however, the disc development programs did exist and there is more than adequate proof of them.. The US 415th NFS encountered German disc weapons launched from below their aircraft over German-held territory which interfered with the aircraft's prop engines. Official photographs and "Foo Fighter" documentation of these German weapons exist and are available to the public despite the USAAF never explaining what that weapon was. Other official US Army and AAF Technical Intelligence Reports from 1945 list similar strange flight craft encountered over the Reich in the last year of the war. There is also the problem of known German varied disc and circular aircraft programs that can be properly identified which include Focke's Fw Rochen patent, Sack's AS-6 V-1, Epps Omega Diskus test models, Schauberger's Repulsin discoid motors, and Schwenteit Elektrische Luft Turbine und Raumschiff patent postwar that is credited as a Schriever/Miethe disc design from WW2 (the mystery V-7). All this evidence is totally known and there is an abundance of photographic and historic evidence about. There is the German evidence as well from Luftwaffe Sonderbüro 13 which was tasked with covering up civilian and military sightings of strange craft over the Reich. On September 29, 1944 a Me-262 pilot on a test run spotted the Andromeda Gerãt cylindrical Raumschiff traveling at 1,200 mph. His report to Sonderbüro 13 is official and on file (although the jet pilot had no idea what the unmarked 348 foot long object was). Sonderbüro 13 covered it up as an unknown Allied craft. For years rumours had been flying round that the Germans had been fully aware of the foo-fighter phenomenon and that they had a special study group formed to look into the problem under the name of "Project Uranus," backed by a shadowy group by the name of Sonderbüro 13 (reminds you of Majestic 12 doesn't it?). This was first detailed in La Livres Noir De Soucupes Volantes (The Black Book of Flying Saucers - 1970) by French ufologist Henry Durrant. The rumour spread in Europe and eventually took physical form in the English language in Tim Good's acclaimed book Above Top Secret where it is used to help substantiate further vague rumours of an Anglo/American foo-fighter study. Good had not checked his facts and had in fact just copied the information direct from Durrant's book. 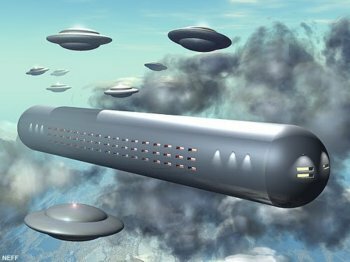 Robert J. Lee's book Fascinating Relics of the Third Reich tells of the capture of one of the huge cylindrical Raumschiff Andromeda Gerãt by the US Army and confirmed it in an interview of "The German Cylindrical UFO". British BIOS Reports acknowledge German disc aircraft development as well as Hans Coler's gravitic battery - the Magnetstromapparat (which the SS turned into an electricity converter). Several of the German engineers and scientists hold postwar disc patents in both Germany and the US: Heinrich Focke, Heinrich Fleissner, Josef Andreas Epp, Viktor Schauberger, Hermann Klaas, Bruno Schwenteit (for Miethe-Schriever), Henri Coanda. If there were no discs how could different engineers, non-related, apply for disc patents postwar as soon as it was permissible by the Allies? And why the sudden drive by the US, Britain, Canada, and the USSR for this specific type of design? The largest and most ambitious flying saucer project was developed by North American Aviation of California. It was the Wright-Patterson United States Army Air Force Base in Dayton, Ohio. It was a strategic military joint effort between the United States, England, Canada and Australia. This project was named the LRV (Lenticular Reentry Vehicle). It was a flying saucer that was forty feet in diameter. It flew by a combination of chemical rocket and nuclear powered engines. It carried four nuclear tipped missiles into orbit for a mission lasting six weeks duration. The speed of this flying saucer was well beyond 17,000 miles per hour. There is evidence of a race to build these type craft in AVRO Canada's disc designs (16 of them) and US disc designs now being declassified by Lockheed, Northrop, and NASA. The publicly displayed Avrocar VZ-9 was a ploy as that craft is not a true flight disc but a GETOL (Ground Effect Take Off and Landing) hovering Jeep that was supposed to be armed with a rear deck bazooka or recoilless gun. It was deliberately meant to fail and to be photographed parked outside on purpose to deceive the Soviets. Operation Bluebook (an official US document) states that (para-phrasing) only "certain developments of the Third Reich in the closing months of WW2 come close to the performance of the UFOs they were investigating". This makes no sense at all unless they are referring to German disc aircraft. A Me-262 or even the Sãnger Hypersonic Bomber could in no way match the performance of unknown disc craft that could accelerate to Mach 10, make a law-of-physics-defying turn that would kill a human pilot, and then stop in mid-air. The USAF had knowledge of the German discs because they held them at Wright Patterson AB before transferring them to MacDill AB for scrapping. So they were completely correct with their statement. USAF reporters for the USAF's in-house magazine in the 1960s visited MacDill and gained unauthorized access to the scrap yard for an article on prototype aircraft. Their cameras and film were seized after they saw 4 German discs in the scrap yard. The next month's issue of the USAF magazine was cancelled. The reporters' story is online and in print. Their eyewitness testimony and account is entirely valid - so much in fact that MacDill had to re-transfer the discs back to storage at Wright Patterson. Most people who know about such craft believe the German discs are still held there. BMW's wartime Prague facility is known and eyewitness testimony of Georg Klein verifies the Flügelrads as well as Schriever's Flugkreisel on site. All were disc fans with BMW Flügelrads more jet auto-gyro than pure flight disc. Most people will only know RLM (German Air Ministry) designations and have no clue that the SS had its very own war production capability. It had its own army (the Waffen SS), own religion (Black Sun Order), and own scientific branch (Entwicklungsstelle IV/V). If Albert Speer as Armaments Minister could not gain access to Himmler's weapons programs there is little wonder that the disc craft and other odd machines are thought of as hoaxes of Neo-Nazis and Fourth Reich advocates. 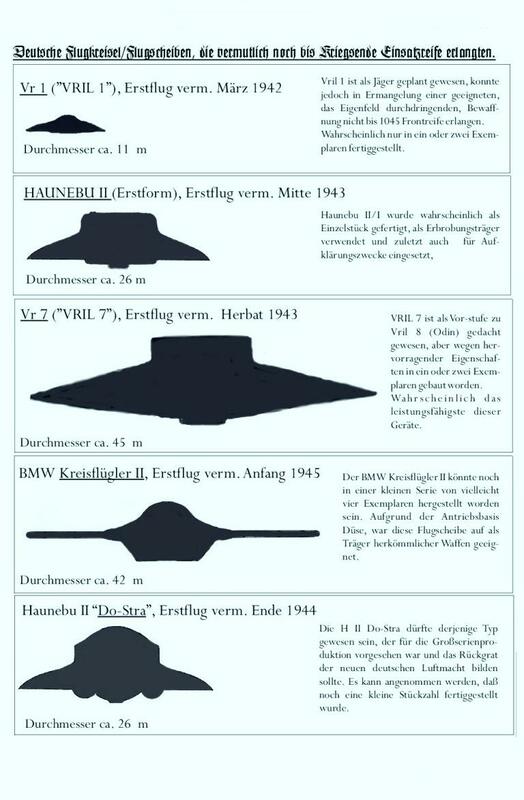 But once the individual discs are investigated and patents emerge, photos, documentation, and Allied reports that are both declassified and still classified... then one begins to understand where the entire postwar UFO/Black Project Aircraft started from - the Reich's arsenal of the SS. "Black Projects" are actually SAPs (Special Access Programs)! Fear of real truth vs. official history written by the victorious Allies makes many people want to deny these craft and even modern sightings of strange craft that amazingly stick close to military bases. The reality of the "Nazi UFOs" has been highly controversial. No really hard historical evidence about the undisputable existence of such advanced technology has been presented so far. 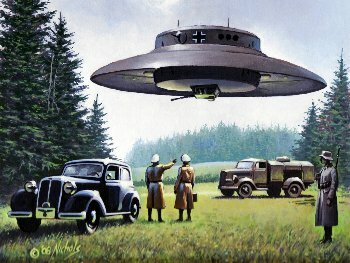 There are some clues and many fascinating rumours that have been creating a real myth about the so-called "Nazi UFOs". Latest developments of the legend include claims of German space journeys to the Moon, Mars and near stars. Also of interest are all those rumours about secret Allied developments of original German projects, Nazi underground bases and related stories, like Hitler's Escape and mysterious U-Boots sighted after the end of WWII. The Haunebu I, II and III space gyros and the Vril I space flying disk had disappeared after May 1945... It is very interesting to note in this context that after its nineteenth test flight, the German Haunebu III is said to have taken off on April 21, 1945, from Neuschwabenland, a vast, officially German territory in the Eastern Antarctic, for an expedition to Mars, about which there is nothing further known. One year later, in 1946, the many sightings that suddenly occurred in Scandinavia of shining objects of unknown and definitely artificial origin caused a great stir among the Allies in East and West. Again one year later, in 1947, and well into the Fifties, a rising number of shining unknown flying objects, doubtlessly steered by intelligent beings, mostly round, disk- or bell-shaped, sometimes cigar-shaped, so-called UFOs appeared over North America. Besides claims of would-be inventors and rumours, there are no original first-hand historical documents about the development of saucer-shaped aircrafts by the Germans. The supporters of the saucers' reality say that most documents and blueprints were destroyed by the Nazis before surrender or captured by the Allied and never released, due to their extreme strategic importance. Investigation for locating possible undisputable sources is still running. Hitler and the Third Reich led the world into a decade of terror in the first half of the 20th century that culminated in World War II. Technology played a greater part in that war than in past conflicts and the Germans developed an amazing array of secret weapons in a short time. Were flying discs part of the Luftwaffe arsenal? And, if so, was this secret looted and used by the Allied victors after the war? Some of the German war-time technical advances are well known. The first military jet was the German Heinkel 178 which flew in 1939. In 1943 the Germans also deployed the only jet fighter to go into regular service during the war, the Messerschmitt 262. This German jet could easily overtake the fastest Allied aircraft. Only Hitler's misguided orders that the planes be outfitted as bombers, instead of defensive fighters, saved Allied aircraft from devastating casualties. Cruise missiles, a staple of current advanced arsenals, were also first used by the Third Reich during the war. V-1 flying bombs were launched from German-held territories across the channel into England. The "buzz bombs," as they were sometimes called because of the sound of their impulse jet engines, could outrun most Allied aircraft making the V-1's almost impossible to stop. The V-1's weakness was its guidance system (a problem solved in modern cruise missiles by the use of computer-controlled radar). Because it couldn't hit a pinpoint target, the V-1 could only be used to cause random terror, not wipe out truly important military assets. The V-2 rocket was the predecessor of the Intercontinental Ballistic Missiles that filled the nuclear arsenals of the Soviet Union and the United States during the Cold War. It traveled up to 225 miles at five times the speed of sound. A single hit could demolish a city block. During the war the V-2 killed 2724 civilians and injured another 6467. Like the V-1, though, it lacked a guidance system that would have allowed it to strike at important targets. The Germans even developed a rocket-powered fighter, the Me 163. Though it never was put into regular service, it was the first aircraft to fly faster than 600 miles an hour. Is it possible that the list of secret weapons produced by Nazi Germany included flying saucers? Did they actually deploy disc shaped fighters or at least experiment with them? Schauberger believed that machines could be designed better so that they would be "going with the flow of nature" rather than against it. 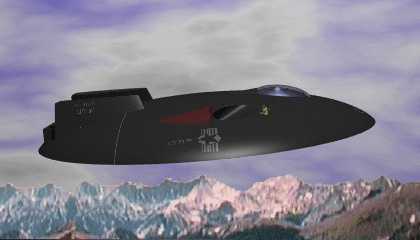 One of Schauberger's projects was to produce a flying machine, saucer shaped, that used a "liquid vortex propulsion" system. His theory was that "if water or air is rotated into a twisting form of oscillation, known as a 'colloidal,' a build-up of energy results, which, with immense power, can cause levitation." According to stories Schauberger built several models, one of which was almost five feet in diameter and was powered by a 1/20 hp electric engine. Some reports indicated that one of the models actually flew. There are also reports that, according to letter Victor Schauberger wrote to a friend, a full-sized prototype of one of his designs was constructed using prison labor at the Mauthausen concentration camp. This craft flew on February 19th of 1945 near Prague and obtained an altitude of 45,000 feet in only 3 minutes. The letter goes on to say the prototype was destroyed by the Nazis before it could be captured by the Allies. After the war Schauberger moved to the United States, where some contend he worked on secret projects for the U.S. government. He died in 1958, apparently claiming his ideas had been stolen. Another German designer involved with the Nazi effort during the war was Rudolf Schriever. Schriever, along with some other engineers named Habermohl, Miethe and Bellanzo apparently came up with several disc-shaped aircraft designs that used more conventional power sources than those Schauberger envisioned. One of Schriever's drawings shows an egg-shaped cockpit surrounded by a rotating fan-like disc that provided the lift. A Miethe drawing depicts a smooth flat saucer with an elongated hump on its back for the cockpit. Both would have been powered by jet engines. As with Schauberger, there were reports that some of these designs were actually built. The Schriever machine was said to have been tested in 1945 and to have reached an altitude of 12 kilometers in a little over three minutes. It had a top speed of 2000 kilometers an hour. There is no real, solid evidence, though, that a test flight ever took place and Schriever himself, who relocated to the United States after the war, indicated that any prototypes of the craft were destroyed, before flying as the Germans abandoned their facilities in the face of advancing Allied troops. Stories also persist that the Germans's also had developed small automatized flying discs. The Feuerball and Kugelblitz stories seem to parallel tales of foo-fighters" told by Allied pilots during the war. Despite this it seems unlikely that Feuerballs and Kugelblitzs were ever actually built or flown. The "foo-fighters" observed were probably some purely natural phenomena. No Allied plane ever reported being attacked by a foo-fighter and it is likely that if the Germans had invented a device capable of tracking planes as well as the foo-fighters apparently did, they would have soon armed it with some effective weapon. So were there really any German disc-shaped aircraft? It seems likely that there was certainly some experimentation with the concept within the Reich. Disc-shaped aircraft have several advantages, including low stall speed and low drag, even at high speeds. The rounded shape can also lower the craft's radar profile making it "stealthy." For these reasons German designers did consider using disc shaped aircraft, as did the U.S. The low stall/drag of the shape was particularly important to the Germans at the end of the war. Months of bombing had reduced German runways to rubble. A saucer shaped craft could have lifted off the ground like a vertical-takeoff-and landing (VTOL) aircraft without a runway at all. It is certain that they produced some models or prototypes, though, it is unlikely that if these machines flew they obtained the outstanding climb and speed figures some stories suggest. These stories may be difficult to disprove, though, since in the chaos at the end of the War, many records were lost or destroyed. 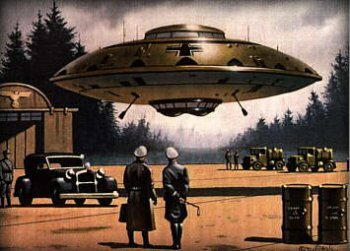 Rumors are likely to continue that the Nazis developed flying saucer technology that was then stolen by the United States and the Soviet Union after the war. This latter suggestion is not wholly without merit, since US and USSR rocketry development after WWII owed a lot to German scientists who were recruited to assist in the superpowers Cold War space programs through an operation known as "Paperclip." There are records, exposed by author Jim Wilson in a Popular Mechanics article in July 1997, that suggest that at least two brothers, Walter and Reimar Horten, were sought by the United States after the war because of their participation in German military saucer programs. Some saucer stories about Germany developed after the War, rather than during it. In particular there is a book, UFOs: Nazi Secret Weapons? in which the author, Ernst Zündel, suggests Hitler escaped at the end of the war to establish a flying saucer base in Antarctica at the entrance of a hole that leads to a hollow "inner Earth." Since science has pretty well established that the Earth isn't hollow, it seems these stories can be disregarded. As for the existence of German WWII flying discs, though, it is a possibility that may never fully be disproved. The idea that Nazi Germany developed highly advanced aircraft or spacecraft appears in fiction as early as 1947. In Robert A. Heinlein's novel Rocket Ship Galileo, the protagonists discover Nazi fugitives living in a base on the moon. However, the idea is not limited to science fiction. Academic Nicholas Goodrick-Clarke, in Black Sun: Aryan Cults, Esoteric Nazism and the Politics of Identity, has documented a fringe belief that the Nazis developed flying saucers (Haunebu or Hauneburg-Geräte, and Reichs- or Rund-Flugscheiben) that they launched, and continue to launch, from a base in the Antarctic territory of New Swabia (Neu-Schwabenland). He includes the theory under the heading of "esoteric Nazism," an ideology that hopes for Nazi restoration through supernatural or paranormal means. • Nazi Germany claimed the territory of New Swabia, sent an expedition there in 1938, and planned others. • Nazi Germany conducted research into advanced propulsion technology, including rocketry and Viktor Schauberger's turbine work. • Some UFO sightings during World War II, particularly those known as Foo Fighters, were thought to be enemy aircraft. The earliest non-fictional reference to Nazi flying saucers appears to be a series of articles by and about Italian turbine expert Giuseppe Belluzzo. The following week, German scientist Rudof Schriever claimed to have developed flying saucers during the Nazi period. A 1967 book by Louis Pauwels and Jacques Bergier, Aufbruch ins dritte Jahrtausend: Von der Zukunft der phantastischen Vernunft, made many spectacular claims about the Vril Society of Berlin. It claimed that the society had made contact with an alien race and dedicated itself to creating spacecraft to reach the aliens. In partnership with the Thule Society and the Nazi Party, it developed a series of flying disc prototypes. With the Nazi defeat, the society allegedly retreated to a base in Antarctica and vanished. When German Holocaust denier Ernst Zündel started Samisdat Publishers in the 1970s, he initially catered to the UFOlogy community, which was then at its peak of public acceptance. His main offerings were his own books claiming that flying saucers were Nazi secret weapons launched from an underground base in Antarctica, from which the Nazis hoped to conquer the world. Zündel also sold (for $9999) seats on an exploration team to locate the underground base. Some people who interviewed Zündel about this material claim that he privately admitted it was a deliberate hoax to build publicity for Samisdat, although he still defended it as late as 2002. Bulgarian engineer Vladimir Terziski, billing himself as president of the American Academy of Dissident Sciences, has built on the claims of Pauwel and Bergier, claiming that the Germans collaborated in their advanced craft research with Axis powers Italy and Japan, and continued their space effort after the war from New Swabia. He writes that Germans landed on the Moon as early as 1942 and established an underground base there. When Russians and Americans secretly landed on the moon in the 1950s, says Terziski, they stayed at this still-operating base. According to Terziski, "there is atmosphere, water and vegetation on the Moon," which NASA conceals to exclude the third world from moon exploration. Terziski has been accused of fabricating his video and photographic evidence..